When looking to find a chavrusa what characteristics or traits do you look for to ensure that it will be successful? Someone who will actually show up on time and prepared to learn. This sounds so obvious, but to actually show up faithfully with one's game face on, is no mean feat. Someone who you can shmooze with. Learning Torah is NOT a mechanical chore. It's a human experience. Besides honing one another's learning skills and sharing subject-related information (whether a Gemara from somewhere else or a botanical fact), practical emunah and other how-to-live Torah points are part of the give and talk (not a typo). In addition, because we are human and because a bond is formed by learning together (CHaVRusa from CHaVeir/CHiBuR) and you want to feel that BOTH OF YOU will help each other grow. Someone who you can shmooze with. Sometimes long-term success needs a short-term break. See  for topics. To protect your time and neshama, avoid talking about politics (shul, local, national, and Israeli). A word to the wise is sufficient. Someone who will push you forward to WANT TO LEARN when the yetzer hara is trying to push you back. And someone that you'll be able to push if and when necessary. Did we mention that you should both be compatible in level of learning? Make sure on the same page (ha, ha) in terms of how much ground you want to cover and with what sort of depth. For example, this week I started learning Masechte Megilah with someone, a thrice weekly chavrusa. We scheduled an amud/session so that iy"H we'll finish right before Purim. [We're already an amud behind!] Since he's new to Gemara, I'll "feed" him any Tosfos I choose to do, as well as a lot of Rashi. He's bright and asks a lot of very sharp questions; that's what I "get out of it." 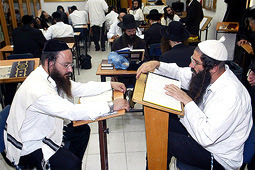 Remember what Rebbe Meir says in Pirkei Avos: If you waste time from learning, Hashem will send more time-wasters your way. IT'S TRUE!! Please use your chavrusa time for learning Torah! Agree that no matter what, the first (10/15/20) minutes will be **ONLY** words of Torah!! Keep that commitment unless someone is G-d forbid dying! informative piece. BTW, there's a new online chavrusa site for matching people.